Thor #10 Review – AiPT! As a longtime fan of comics, Thor has always remained on my periphery. I was aware of his current status in the Marvel Universe, but never read each issue with unwavering enthusiasm. Jason Aaron and Mike Del Mundo’s run on Thor has made faithful the faithless. Every issue, every page, and every panel brims with nuance and pure adulation for the medium. Having already been impressed with the team’s current level of work it is surprising to see that Thor #10 has stepped up the game entirely. Remarkably, Aaron weaves a story of gods that connects with fans on the most basic of human themes, family conflict. With the War of Realms looming on the horizon Aaron focuses on “All-Father” Odin, with Malekith’s machinations remaining on the fringe. Thor #10 proves that despite the larger-than-life characters that occupy this world, relatable stories/themes will continue to reach the audience. The appropriately titled “A Boy and His All-Father” takes readers through a somber journey into the mind and actions of Odin. While Malekith continued to build his army, Odin stood listless. With Asgard lost, and only the vestiges of a once lush realm remaining, regret takes hold. The reality of a War on the grandest of stages prompts Odin into action. Odin undertakes one of the most difficult challenges of a life that has spanned eons, reaching out to his son Thor, and finally being the kind of father he sought to be for centuries. Sadly, good intentions are rarely enough. What begins as an attempt to relate to Thor quickly sours into an epic battle of father vs. son and god vs. god. Meanwhile, Loki contends with his own fraternal struggles in Jotunheim. His place in the realms comes under question, in terms of both kinship and which side of the war will he stand with. Starting from the very first page, Aaron taps into Odin’s thoughts. This first-person narrative perspective contributes to the quality of the story being told rather than providing Aaron with a cushion for the plot. Rarely do people – and three-dimensional characters for that matter – say exactly what is on their mind. Why would Odin be any different? The most excellent example of this cognitive dissonance is during the unwarranted clash with his son Thor. Every barrage Odin throws towards Thor is accompanied by an endearing thought for his son. On the outside Odin wages battle, but on the inside, he hates himself for being unable to express his love. It is this very dichotomy that exudes raw emotion at its finest, proving Aarons grasp of encapsulating emotional relevance. The situation is relatable to anyone who has struggled to express how they honestly feel, lending gravitas to the situation at hand while simultaneously drawing fans deeper into the situation at hand. The underlying message of Father vs. Son is pervasive throughout the issue, exploring more than one relationship. Loki has always struggled with his identity, torn between two realms; Jotenheim, the land of the Frost Giants and Asgard, home to the Norse gods. Loki fails to live up to the sheer brutality inherent to Jotunheim. His refusal to outright kill a fellow Jottun draws the ire of his father, Laufy. The juxtaposition here is telling. On the one hand, we have a Father living in regret, unable to connect with his son. On the other hand, we have Loki, a son losing the battle for any parental encouragement. However, the actual point of interest can be found in the character’s intent. Laufy’s disappointment rings true, expressing his discontent with conviction. Conversely, Odin is anything but. He truly does love his son but fails to emote his adoration. Centuries of neglect are not easily undone. It is hard to say which is worse, but Aaron’s writing hits home. Aaron also connects the plot in the foreground to the ongoing War of Realms lying underneath the surface. The outcome of the Loki’s situation puts his loyalty in doubt. Malekith approaches Loki with concern for his place in the War of Realms, using his silver tongue to sway the god of mischief. Loki plays coy, leaving Malekith and readers equally perplexed regarding Loki’s decision. Balancing multiple plots is a difficult task for writers, Jason Aaron does so with aplomb. Another quality Aaron brings to the table is his ability to write “visually.” His writing is geared towards showcasing the talents of his artist. This collaborative style blends in perfectly with as skilled a penciler as Mike Del Mundo. One splash page in particular perfectly blends writing and art by conveying a lifetime of neglect at once. Different iterations of Thor throughout his lifetime (as a boy, teenager, young man, etc.) approach Odin seeking his approval. Yet each analog is met with Odin’s apathy. This one page perfectly captures the themes of the issue: regret, an inability to connect with others, and the repercussions of our actions. Mike Del Mundo ups his game with every new entry in the series, and Thor #10 does not disappoint. Simply put, Mike Del Mundo is a master of visual storytelling. Literally, many of the splash pages and panels in this issue can be used to teach young artists. Del Mundo plays with the notion of typical layouts. I can’t express just how unique his work is, only examples will do him justice. To begin, Mundo lays out an entire montage on Thor’s Hammer. 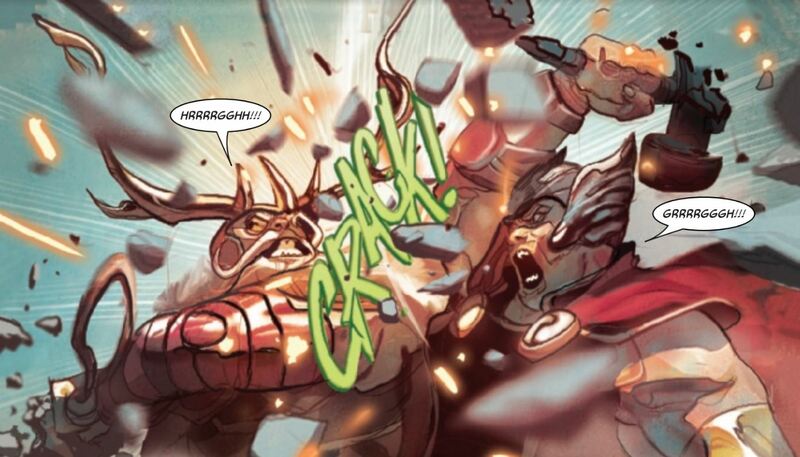 All the while the Hammer rests in Thor’s grip as he smashes into Odin’s face. Words cannot do the page justice but picking up the issue is an excellent start. As aforementioned, Del Mundo caters to Aaron’s writing in the splash page we’ll call “A lifetime of disappointments,” perfectly expressing a shattered intimate relationship in one powerful image. Yet, his artistry warrants further attention. He frames an entire page with the horns that decorate Odin’s Helmet. During the megalithic fight scene between Odin and Thor, one enchanted hammer after another is destroyed in their wake. There is a slight lull in the action as the two Gods are caught in a stare down. Del Mundo approaches the panel from Heimdall’s first-person point of view. Thor and Odin draw the readers eye in the background as a glut of destroyed hammers showcase the remnants of battle in the foreground. Thor #10 is a must-read for fans of every ilk. Whether you have a casual relationship with the characters or know your Svartalfheim from your Nidavellir, the issue perfectly captures everything good about this series. Abundant action, long and short-form storytelling, themes of human interest, and art that is unequaled makes Thor #10 a shining example of everything we love about comics.